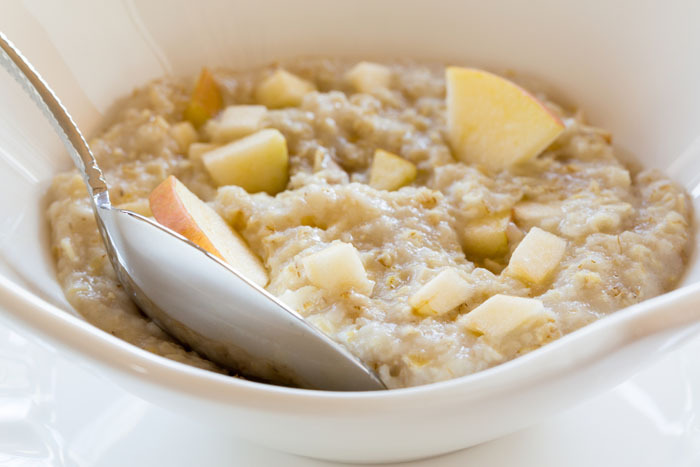 Apple and Ginger porridge from The Eat, Fast, Slim Diet – the life-changing fasting diet that everyone’s talking about. The Eat, Fast, Slim Diet by nutritionist Amanda Hamilton is the original life-changing fasting diet for amazing weight loss and optimum health. Try Amanda’s healthy plans with more than 100 nutritious recipes including these 5 warming winter breakfasts. 1. Put the oats, milk and 270ml/9½fl oz/generous 1 cup water in a nonstick saucepan. Bring to the boil over high heat, stirring frequently. Turn the heat down to medium and simmer for 10 minutes, stirring frequently, until the oats are cooked through and creamy. 2. Stir in the apple and ginger and serve immediately. 1. Put the oats, milk and 270ml/9½fl oz/generous 1 cup water in a nonstick saucepan. Bring to the boil over high heat, stirring frequently. Turn the heat down to medium and stir in the chopped figs. Simmer for 10 minutes, stirring frequently, until the oats are cooked through and creamy. 2. Sprinkle the porridge with the walnuts, nutmeg and honey and serve immediately. 1. Put the dates in a bowl, cover with warm water to soften or leave to soak in cold water for 2–3 hours, then drain. 1. Put the quinoa, orange juice, raisins and cinnamon in a nonstick saucepan. Bring to the boil over high heat, stirring frequently. Turn the heat down to low and simmer for 20 minutes, stirring occasionally, until all the liquid has been absorbed. Remove the pan from the heat and leave to stand, covered, for 10 minutes. 2. Serve topped with yogurt. Do you long to wake up refreshed and feeling full of energy? Are you not getting the quality or amount of sleep you need? Do you have difficulty drifting off, or lie awake in the small hours, with bad dreams? Try these 5 steps to reset your sleep-wake cycle from sleep expert Professor Idzikowski. For simplicity, I’ve assumed that you want to condition your body so that it’s ready for sleep at 11pm and ready to wake up at 7am. If these times don’t suit you (for example, if 10pm until 6am works better with your schedule), that’s fine – you can change the times, but try to make sure they allow for seven to eight hours of shut-eye every night. 1. You’ll need to set aside four weeks for this, because conditioning your body into a new routine won’t happen overnight (excuse the pun). Clear your diary of all social engagements that would keep you out late in the evening and let your friends and family know that you are not contactable between 11pm and 7am. 2. 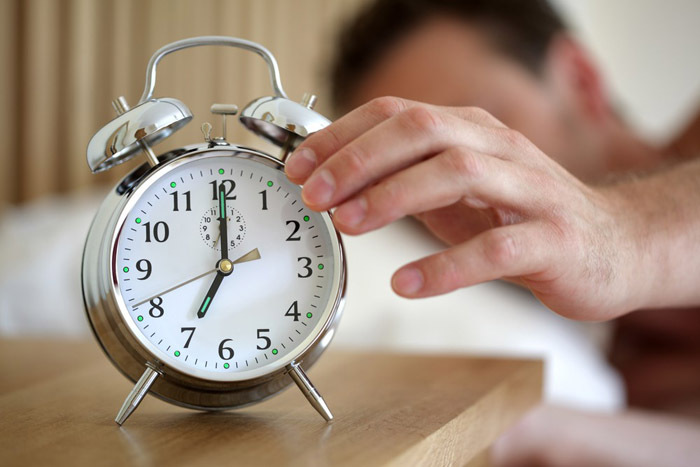 Set your alarm clock for 7am and make sure that it’s on its loudest setting so that it wakes you straightaway. Put the alarm clock out of reach so you have to get out of bed to stop its noise. 3. On the first night of your new routine, practise your pre-sleep rituals in time for you to be actually in your bed by 11pm with your eyes closed, regardless of whether or not you feel sleepy. 4. When your alarm goes off, get up. Immediately. Go to the window, open the curtains and let light flood in. If it’s still dark outside, turn on all the lights. Artificial light isn’t as effective at setting your biological clock as natural light, but it’s better than trying to wake up in the gloom. 5. Repeat this ritual every night and morning for the whole four weeks, by the end of which you should have reconditioned your body into a healthy sleep-wake cycle. You’ll know you’ve done it because you’ll naturally feel sleepy at 11pm and you’ll be on the cusp of wakefulness when the alarm sounds in the morning. One of the world’s leading sleep experts, Professor Chris Idzikowski, reveals his wisdom in a down-to-earth and reassuring way. Sound Asleep gives you the in-depth understanding you need to make your sleep more restful, more energising and more satisfactory. 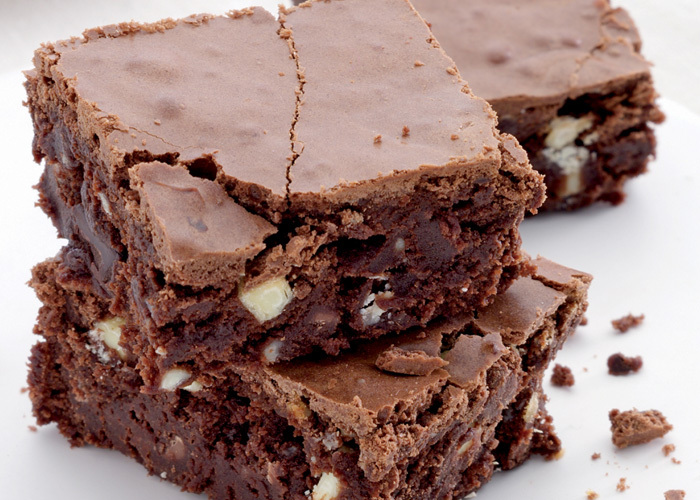 These scrumptious brownies make a wonderful treat with their ‘fudgey’ texture and nutty chocolate flavour. They’re also gluten-free so are suitable for coeliacs. Brazil nuts are particularly rich in the mood-enhancing mineral selenium – a single nut a day will ensure that you are not deficient in this mineral. The occasional Chocolate & Brazil Nut Brownie will satisfy any desire for something sweet without you having to overindulge. Fructose is used in this recipe as this natural sugar doesn’t cause irregular blood-sugar levels in the same way that refined sugar does. 1. Preheat the oven to 180°C/350°C/Gas 4. Grease and line the base of a 20cm/8in square tin. Melt the butter and chocolate in a heatproof bowl placed over a saucepan of gently simmering water, making sure the bottom of the bowl does not touch the water. 2. Remove the bowl from the heat, stir, then leave to cool slightly. Stir in the vanilla extract, ground almonds, fructose and Brazil nuts and mix well until combined. Beat the egg yolks lightly, then stir them into the chocolate mixture. 3. Whisk the egg whites in a grease-free bowl until they form stiff peaks. Using a metal spoon, stir a spoonful of the whites into the chocolate mixture to slacken it, then fold in the remaining egg whites until they are well combined. 4. Spoon the mixture into the prepared tin and bake in the preheated oven for 20–25 minutes until risen and firm on top but still slightly gooey in the centre. Remove from the oven and leave to cool in the tin, then turn out, remove the baking parchment and cut into 16 squares. Find more delicious, simple-to-make recipes using naturally sweet foods and alternative flavourings in Quick & Easy Low-sugar Recipes by Nicola Graimes. Savoury foods can also be surprisingly high in added sugar too, particularly canned foods and sauces, and you’ll find specially adapted recipes for healthier, low-sugar alternatives. 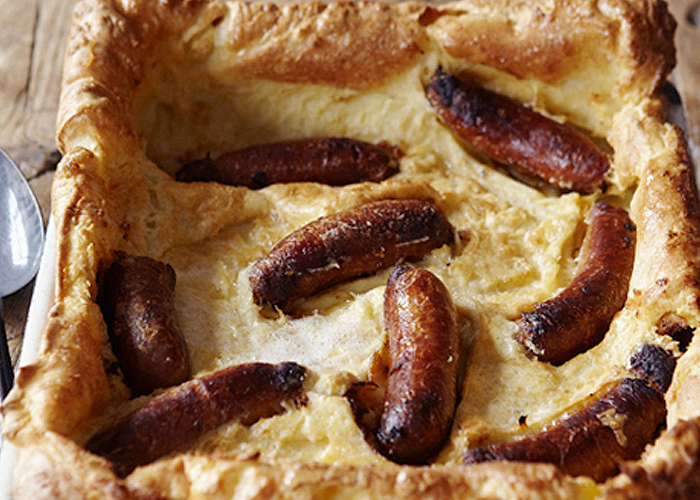 It’s official, Toad in The Hole is making a comeback. From trendy restaurants to the family dining table it’s the comfort food we’re all craving this winter. Johnnie Mountain the charismatic Chef Patron of The English Pig, offers his foolproof recipe served with a delicious onion gravy. 1. To make the batter, sift the flour and salt into a bowl. Whisk the eggs and milk with 4 tablespoons water, then gradually whisk three-quarters of the mixture into the flour to make a smooth batter. Whisk in the remaining milk mixture, a little at a time, until the consistency of single cream. Transfer to a jug and leave to rest until ready to use. 2. To make the gravy, melt the butter in a large frying pan over a medium heat. When the butter is foaming, add the onions and thyme. Turn the heat down slightly, cover the pan, and cook the onions for 30 minutes, stirring frequently, until soft. Uncover the pan, increase the heat to medium and cook for a further 10 minutes until the onions have slightly caramelized. Stir in the flour, then whisk in the red wine and stock. Bring to the boil, then turn the heat down and simmer for 10-15 minutes until the gravy has thickened slightly. Whisk in 1 teaspoon of the redcurrant jelly, adding more to taste, if you like. Season with salt and pepper and leave to one side. 3. While the onions are cooking, preheat the oven to 220°C/425°F/Gas 7. 4. Heat 2 tablespoons of the oil in a large frying pan over a medium heat. Add the sausages and cook for 8-10 minutes, turning them regularly, until golden brown all over. It is important to brown them properly as they won’t colour in the batter. While the sausages are cooking, pour the remaining oil in a medium-sized roasting tin and heat in the oven for 5 minutes until very hot. 5. Carefully remove the tin from the oven and put it on the hob over a medium heat. Pour in the batter (it should start to bubble at the edges) and sit the sausages in the batter. Immediately return the tin to the oven and bake for 10 minutes. Turn the heat down to 200°C/400°F/Gas 6 and bake for a further 25-30 minutes until the batter is puffy on top and crisp on the bottom. Reheat the gravy, if necessary, and serve with the “toad”. I like to serve this with peas, but any green vegetable would be great. With more than 100 recipes Pig shows you how to cook pork brilliantly. Including, ‘Home Favourites’, ‘Cured, Dried, Preserved & Smoked’, ‘Aromatic & Spicy’, and Chapter Four, ‘Slow-Cooked’, reveals the secret of truly succulent pork with recipes such as Slow-Roast Belly of Pork. Special features throughout explain the different cuts of meat and how to smoke, preserve, cure and braise. If you could have a conversation that would change your life, who would it be with? Your partner, a colleague, your boss, a neighbour? And if you found a way to talk, what difference would your Big Conversation make? Would it help to clear the air, heal a hurt or renew a relationship? Author and Leadership Development Consultant Sarah Rozenthuler believes that conversation is pivotal in our lives, yet many of us are holding back from talking. We fear upsetting other people, losing our job or damaging the love we have. In her book Life-changing Conversations, Sarah shares how to have that conversation, leave your baggage behind and move forward in your life. We are living in times of great change – technologically, socially and financially. Many of us are experiencing upheavals that we never could have anticipated even a short while ago. Whether we have to step into a new arena of work, draw a line under a relationship or uproot from our home, we have to roll with the punches as never before. In the midst of this turmoil, the need for heart-to-heart, human-to-human encounters is becoming ever more pressing. As we hurtle toward a future full of unknowns, many of us feel increasingly disorientated. With tomorrow’s technology arriving before we’ve even mastered today’s, we can feel isolated behind our computer screens, haunted by the conversations we’re not having. Navigating these uncharted waters calls for a new set of capacities. We need an expanded sense of self, new skills and bridge-building tools to reconnect with each other. We all have courage. Rather than acquiring it, we need to cultivate it. Just as an athlete strengthens his or her muscles ready to run a marathon, the more we practise being courageous, the easier it becomes. Look back at the times in your life when you’ve shown some strength. Identify what helped you in the past, to see what strategies you can apply to your current situation. Take a closer look at what’s making you anxious. Be specific. Identify what the fear is – for example, it might be of rejection, loss or pain. Become aware of how your fears become smaller when you understand them. Think through the risks and benefits of having the conversation and staying silent. Let yourself sleep on the decision. Become clear about your reasons for talking – or not talking. Reflect on how you can “meet” the other person where they are. An introvert will benefit from time to gather their thoughts before speaking. An extravert needs to talk to work out what they think. Flex your style to adapt to theirs. Take some quiet time to go within. Hear what the courageous part of you has to say. Listen to this voice of wisdom inside. Ask questions and let it speak without judging or rejecting. Embrace the messages that it brings. Decide what your next move is, set a deadline and then do it. Ask someone to check with you later that you’ve done it. Use the power of your imagination to visualize yourself taking action in the way you’d like. Whatever the form of the particular challenge we face we can equip ourselves to ride these shockwaves of change. We can learn to have Life-changing Conversations. A hearty, satisfying low-carb casserole – perfect for a rainy Sunday afternoon. 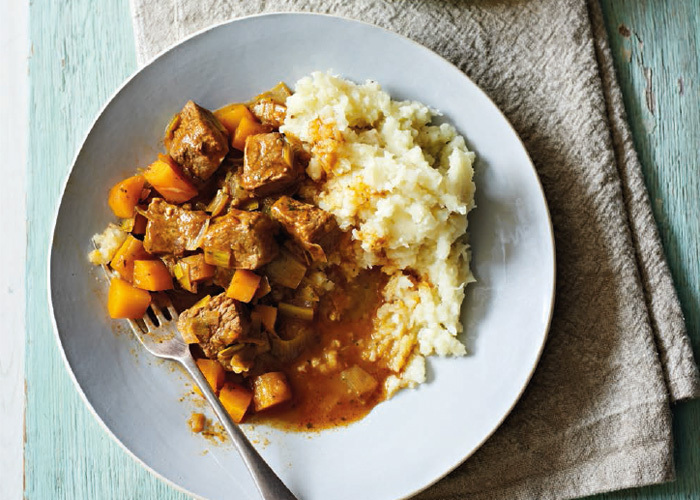 This is a real hearty dish which I love to cook on a rainy Sunday afternoon, says nutritional therapist Laura Lamont, author of The New Low-Carb Diet. Its rich, thick gravy accented with mint and poured over the hot buttery mash makes for great comfort food. In The New Low-Carb Diet I’ve devised a plan for a new version of a simple carbohydrate-controlled diet. Even if you are trying to lose weight, carbohydrates are still a valuable source of energy but what we want are the complex carbs that release their energy slowly, not the simple carbs that give you a sugar rush. 1. Preheat the oven to 180°C/350°F/gas 4. Heat the oil in a heavy-based, flameproof casserole dish over a medium heat, add the onion, celery and garlic and cook for 5 minutes until soft. Add the lamb and fry for a few minutes until lightly browned. Add the leek, carrots, stock, rosemary, mint sauce, tomato purée and stevia powder. Bring to the boil, then cover with a lid and transfer to the oven for 1½ hours until the lamb is tender and the sauce has thickened. 2. After about 1 hour, put the celeriac into a saucepan of boiling water and return it to the boil. Turn down the heat to low, cover with a lid and leave to simmer for 10 minutes. Add the cauliflower florets and cook for a further 15 minutes until the vegetables are very soft. Drain well, then return to the pan, add the butter and season to taste with pepper. Mash together well and serve with the lamb. If you’re looking for a new approach to healthy eating and weight loss, nutritional therapist Laura Lamont’s The New Low-Carb Diet is the effective long-term answer. Out in April – just in time for summer. Nicola Graimes’ melt-in-the-mouth Orange-drenched Date and Raw Chocolate Truffles show how easy it is to coax the best out of uncooked ingredients. 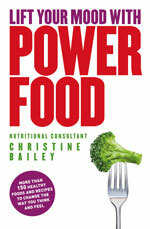 If you’ve never tried a raw food recipe this is the perfect introduction to raw food cooking. Make the truffles this weekend and invite your friends over to sample them, or maybe just treat yourself! 1. Put the almonds and cashews in a food processor and process until ground, then transfer to a mixing bowl. Put the dates in the food processor and process to a paste. You may have to stop occasionally to scrape the dates from the sides of the bowl. Put the date paste in the bowl with the nuts and add the orange juice and zest, agave syrup and raw cacao. 2. Using a mortar and pestle, grind the cardamom seeds, then add them to the bowl. Stir until combined into a thick paste. 3. Coat a plate with extra raw cacao powder. Shape 1 tablespoon of the date and nut mixture into a ball and roll it in the cacao. Repeat to make 9 cacao-coated truffles in total. 4. Coat a second plate with desiccated coconut. 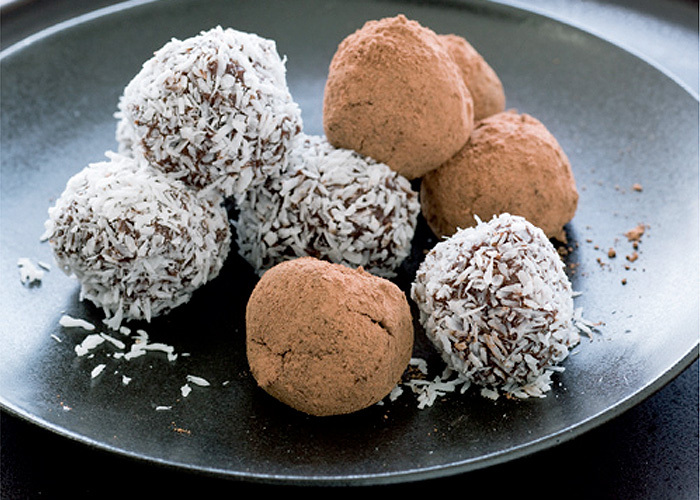 Follow the same method in step 3 to make 9 more truffles, this time rolling them in the coconut. Chill the truffles until ready to eat. 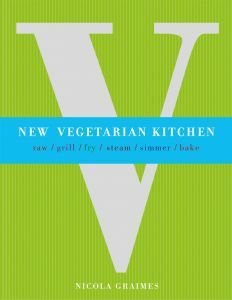 There’s more delicious vegetarian sweet treats in New Vegetarian Kitchen by Nicola Graimes. Nicola is passionate about vegetarian food. For her, it is all about celebrating flavours, textures, aromas and colours – and a magical transformation from the raw ingredients to the finished dishes. 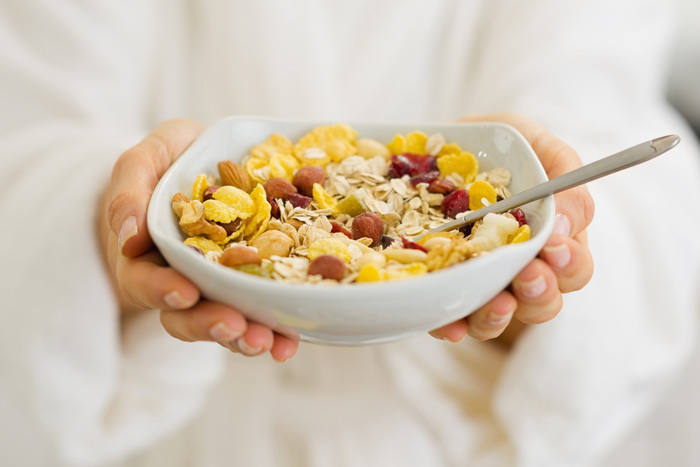 Foods to fight depression – a Muesli mix containing pumpkin seeds, sunflower seeds, Brazil nuts and almonds is packed with good sources of magnesium. Magnesium deficiency has been strongly linked to depressive symptoms. Can the answer to beating depression really lie in food? Yes it can. People may have told you to get out and have fun, socialize and have a good time getting drunk, but that could make you feel worse. What they didn’t tell you was that feeling good could lie in some pretty special foods that don’t mean spending your way out of depression. These are the six dynamic ‘depression fighting’ groups of foods that have specific properties to stimulate certain hormones and fan the flames of happiness. Research shows that people with low levels of folic acid are more like to suffer from depression. Scientists at the UK Medical Research Council recommend plenty of folic acid daily as a preventative measure for depression. Folic acid is a water-soluble vitamin and the body can’t retain it for long, with any excess being expelled in the urine. This means that any of us could be deficient in folic acid at any one time; it is a hard vitamin to keep in the body. Eating some of these foods will help keep your levels high. Vitamin D supplements are cheap and easy to obtain and a wise investment for helping to beat depression. When Alexandra Massey was pole-axed with depression she looked for ways to help herself recover without resorting to prescription drugs. She is a passionate champion for those who still suffer www.alexandramassey.co.uk. 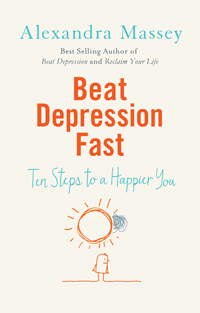 In her latest book, Beat Depression Fast, Alexandra provides a ten-step programme to follow in an easy, straightforward sequence that builds on strengths and skills. Featuring practical exercises throughout to help put theory into practice, this book will help you make real changes from Day One. 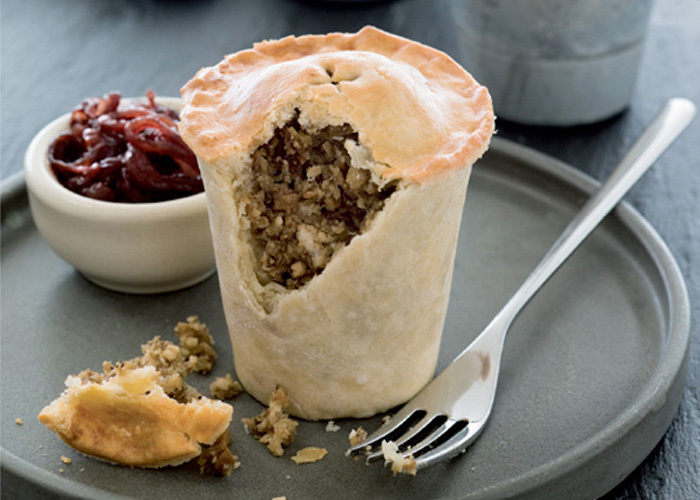 Delicious individual vegetarian pies – a perfect winter meal! When the wind is howling and the rain is pouring down there’s nothing better than a tasty home cooked pie – and there’s something extra special about an individual pie. They make a tasty vegetarian supper or Sunday lunch served with red onion chutney and a red wine gravy. 1 First make the pastry. Sift the flour and salt into a bowl. Rub in the butter with your fingertips until the mixture resembles fine breadcrumbs. Add the egg yolk and a little cold water, if necessary, and mix to combine; press the dough together to make a smooth ball, wrap in cling film and chill for 30 minutes. 2 Meanwhile, put the porcini mushrooms in a small bowl and just cover with boiling water; leave to soak for 20 minutes. Strain them, reserving 3 tablespoons of the soaking liquid, then roughly chop. 3 Heat the olive oil over a low heat and fry the onions, stirring occasionally, for 15-20 minutes, partially covered, until golden and very soft. Add the garlic, porcini and chestnut mushrooms and thyme and fry uncovered, for 5 minutes, stirring occasionally. Add the sherry, soy sauce and reserved mushroom liquid and simmer for 2 minutes or until the liquid has reduced by half. 4 Finely grind the cashews in a food processor and transfer to a large mixing bowl. Stir in the breadcrumbs and almonds. Put the mushroom mixture in the food processor and process to a smooth paste, then add to the cashews. Season with salt and pepper and stir until well combined and the mixture has the consistency of a firm pâté. 5 Grease four 150ml/5fl oz/scant cup dariole moulds. Roll out the pastry on a lightly floured work surface and cut out 4 circles to line the moulds, gathering up the trimmings. Put 1 circle in each mould and press it from the bottom upwards to get rid of any air bubbles and shape it into a pastry case. Leave 2cm/¾in of the pastry overhanging the top of the mould. 6 Preheat the oven to 200°C/400°F/gas 6. Fill the pastry cases nearly to the top with the mushroom mixture. Re-roll the pastry trimmings and cut out 4 circles to fit as lids on top of the moulds. Wet the edge of each pastry case with water and press the lid on the top, pinching with your fingers to seal. Trim any excess pastry. 7 Brush the tops with egg, put the pies on a baking sheet and bake for 35–40 minutes until golden. Leave to rest for 2–3 minutes before loosening the pies with a knife and carefully turning them out. Serve hot with chutney. Beetroot is now in season, so it’s the perfect time to try some new recipes. Beetroot has an earthy, sweet flavour and vibrant magenta colour which lends itself to so many savoury – and even sweet – dishes. It is a close relative of chard and spinach, so be sure not to waste the leaves, as they can be prepared and cooked in the same way. Bake the firm globes of beetroot whole (unpeeled to stop them bleeding) or reduce the roasting time by cutting them into wedges; either way they need to be cooked until tender and richly sweet. Alternatively, boil, pickle or grate raw into salads – and cakes! And then there’s the stunning Italian candy-striped beetroot, also known as chioggia, with its concentric circles in varying shades of pink, red, yellow and white. It looks dramatic cut into paper-thin slices and served as part of a salad. One of my favourite beetroot recipes is to add them to savoury or sweet muffins, such as my Beetroot and Goats’ Cheese Muffins. The beetroot makes them wonderfully moist, in much the same way as adding carrots or courgettes does, and they also benefit from the vegetable’s vibrant ruby colour. If using ready-cooked beetroot, make sure you buy the kind without any vinegar. Also, try to use a crumbly goats’ cheese rather than a runny one for the best results. The secret to successful light muffins is to keep mixing to a minimum; briefly fold the ingredients together and you’re done – they don’t even have to be thoroughly combined. 1) Preheat the oven to 190°C/375°F/Gas 5. Lightly grease a 12-hole deep muffin tin with oil (or you could make 6 large muffins using large paper muffin cases). 2) Sift together the flour, salt, baking powder and bicarbonate of soda into a mixing bowl. 3) Mix together the eggs and yogurt and beat in the melted butter. Stir the dry ingredients into the wet ingredients, then gently fold in the goats’ cheese and beetroot until just combined. 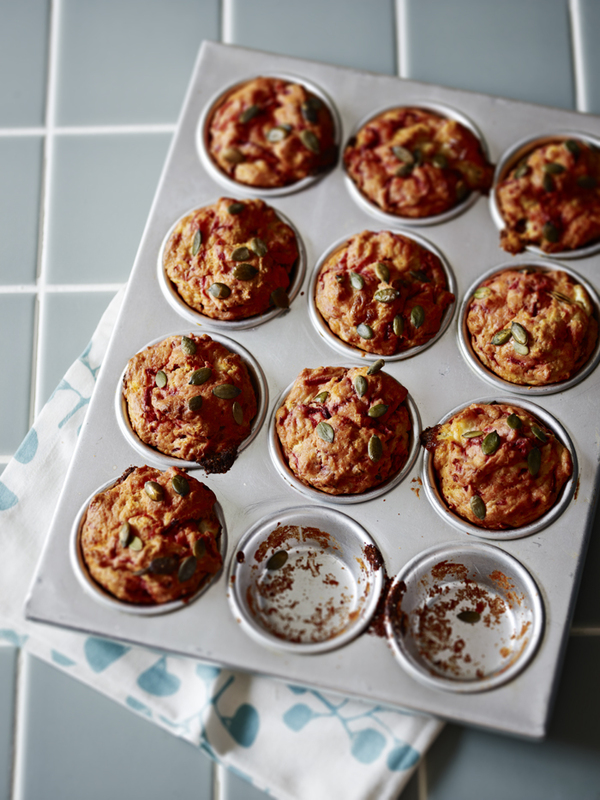 Spoon the mixture into the prepared muffin tin, sprinkle with the pumpkin seeds and bake for 20–25 minutes, or until risen and golden. Try these quick recipes to turn a bumper crop into something truly delicious. A spoonful of this thick, sticky, earthy, savoury jam goes particularly well with robust-flavoured cheeses, or nut or bean-based dishes. Sauté 1 large finely chopped onion in 1 tbsp olive oil for 10 minutes until softened but not coloured. Add 2 (about 280g/10oz) peeled and grated raw beetroot, 1 large peeled and grated apple, 100ml/ 3½fl oz/scant ½ cup each of cider vinegar and water and 4 tbsp soft brown sugar. Stir well and bring up to boiling point, then turn the heat down to medium-low, part-cover the pan and simmer for 40 minutes until the beetroot is very tender. Remove the lid and simmer for 15 minutes, stirring now and then, to reduce the liquid in the pan and until the mixture is jam-like in consistency. Season with salt and pepper and leave the jam to cool before serving, or spoon into a sterilized jar and keep for up to 1 month. This simple dip is delicious slathered onto warm flatbreads or scooped up with vegetables. I like to roast my own beetroot but you could use ready-cooked if time is short. Preheat the oven to 200°C/400°F/Gas 6. Trim 2 (about 280g/10oz) beetroot and wrap them in foil. Roast for 1 hour–1 hour 15 minutes until the beetroot can be easily pierced all the way through with a skewer. Leave until cool enough to handle, then peel away the skin and roughly chop. Blend the beetroot with 6 tbsp natural yogurt, the juice of ½ lemon, 1 crushed garlic clove, 1 chopped red chilli, 2 tsp ras el hanout and ½ tsp ground cumin until smooth. Season well with salt and pepper and spoon the dip into a serving bowl. Serve scattered with crumbled feta cheese and coriander and mint leaves. Preheat the oven to 180°C/350°F/Gas 4. Thinly slice 5 raw beetroot (they should be about 3mm/⅛in thick) using a mandolin or very sharp knife. Pat the beetroot slices dry with kitchen paper and lightly brush both sides with olive oil. Put in a single layer on two baking sheets and roast for 20–25 minutes, turning the beetroot once and swapping the trays around at the same time, until just crisp (they will crisp up more when cool). Keep an eye on the beetroot as they can burn easily in a matter of minutes. Drain on kitchen paper and season with sea salt. 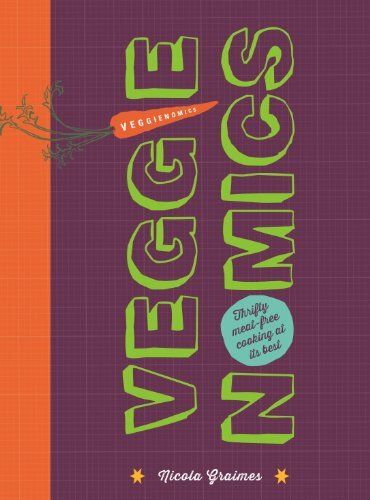 Veggienomics is available from June 1st, but you can pre-order it now. It was probably some Puritan long ago who introduced the idea that “Curiosity killed the cat.” I’m sure they had it wrong: more likely, it is curiosity that gives a cat its proverbial nine lives. Curiosity can serve as your personal rebirth. If you are concerned about any dangers it might bring, consider this: Curiosity builds character. It creates powerful life experiences. It is to be celebrated. Make a list of some of the things you are curious about – as many as you can think of. Do not edit the truth. If you are interested in cabaret singing, candlemaking or cross-dressing, that’s great. Resolve to fulfil your curiosity about these things. Each week, do something simply to satisfy your curiosity. Make it a fun game. Pick an area in which you have no experience, and plunge in to make your discoveries. Establish a curiosity quota, and fill it every week. If you find that you like being curious, raise your weekly quota to two or three items. You can even set yourself a daily curiosity target. Read outside your circle. I know a woman who reads everything. She has no pets and yet she reads pet magazines; she has no children at home, yet reads parenting magazines; she is not African-American, yet reads Ebony. Take a new class. Often, the older we get, the more constricted our world becomes if we do not consciously continue to expand it. Going to classes on topics unfamiliar to you is a way to open yourself up to worlds of new possibility. Even if you do not stick with a new class, you are sure to learn something. Seek out different kinds of people. Do not make the mistake of assuming that the only people you can have a great conversation with are people very like yourself. Everybody has great stories to tell, and interesting opinions about life – although some are better than others at communicating. Take every opportunity to go where different kinds of people gather – a wine lovers’ dinner, a meeting of local environmentalists, a bookstore workshop. Do you ever hear yourself say that you are too old or too out of shape to do something? That is an excuse. Nothing you ever do of a physical nature will feel natural the first time you do it. Be willing to look and feel incompetent – to be the clumsy one in a yoga class, or the last person to pick up a new dance step. Your new physical venture will one day seem as easy as driving your car. Do it, your body will adjust and you will be expanded. Want more from your life? Nothing reflects your quality of life more than your thinking. With 20 specially devised exercises, You Can Think Differently will teach you how to free your mind of negative attitudes and to focus and prioritise. 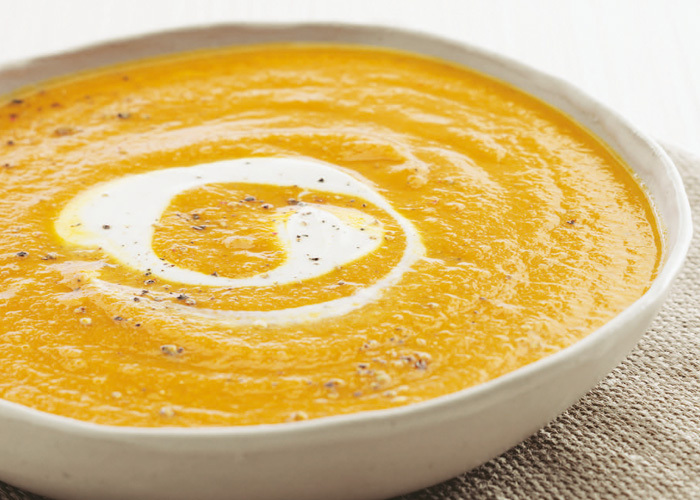 This hearty, thick carrot soup is rich in vitamin C and beta-carotene. These antioxidants are important to help protect the brain cells, neurotransmitters and the essential fats in the cell membranes from free radical attack. Make up a large batch and freeze in portions to make a speedy light meal when time is short. For an energizing lunch accompany the soup with some additional protein such as slices of cooked fish, chicken or eggs. And once cool, the soup can be frozen for 2–3 months. 1. In a large pan, soften the onion and garlic in the oil for a couple of minutes. Add the carrots, celery, mustard, onion powder, salt, Tabasco, thyme, ginger and stock. Bring to the boil, then turn the heat down, cover with a lid and simmer for 30 minutes. 2. Purée the soup with a hand-held blender or pour into a food processor and blend until smooth. Swirl 1 teaspoon of natural yogurt in each bowl. Season with black pepper and serve.